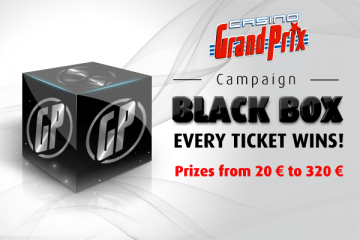 In campaign “Black Box” You will get one stamp with every at least 20€ winning in slot games. You will get access to “Black Box” by collecting 10 stamps. From box You can choose one ball, there are balls with different values from €20 to €325. Drawing takes place in casino Rävala on every Monday at 7.00pm, in casino Port Artur on every Tueseday at 7.00 pm and in casino Vilde on every Wednesday at 8.00pm. NB! “Black Box” tickets are valid for 365 days (1 year).